The popular perception of the 1st July 1916 is of infantry waiting for whistles to blow before scaling ladders, encumbered with heavy equipment, to advance in broad daylight in extended lines with rifle and bayonet across their chest at the ‘high-port’. These men, the cream of Kitchener’s Army, advanced at walking pace across a shell scarred No-Man’s-Land towards a well-armed, professional enemy, to be mown down in their tens of thousands by machine-gun and shellfire. The fault lay with incompetent, unimaginative generals. On that fateful morning the best of a generation were slaughtered. Some of these commonly held views are based, in part, on fact but not all. In truth, unimaginative tactics were only used by a few attacking units. Sir Henry Rawlinson, commanding Fourth Army, had entrusted his subordinates at Corps, Division and Brigade level to employ tactics suited to the terrain they would attack, the nature of German defences opposite, the level of training and ability of their troops and to make best use of the weapons and specialists at their disposal. On 1 July at least 30,000 of the attacking troops advanced at a run. Many attacked in single file and over fifty percent of the vanguard battalions crept into No-Man’s-Land prior to the assault or exited from shallow ‘Russian Sap’ tunnels dug beneath No-Man’s-Land. In most cases planning was meticulous and tailored to each division; no two assaulting divisions followed the same scheme of attack. In this book the author, with 10-years of research, sets out to chronicle in greater detail than ever before the story of XIII Corps and the successful assaults by 30th and 18th Divisions. As the only Corps to achieve all of its objectives for Z Day, the book will seek to determine why this success was attained, when so many other units along the front barely crossed No-Man’s-Land. 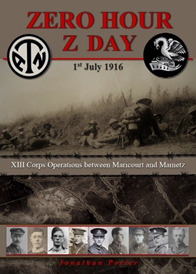 Using previously unseen material and utilising untold accounts he analyses the build-up, preparations, intelligence, weapons, tactics, training, rehearsals and attack undertaken at Zero Hour, Z Day between the villages of Maricourt and Mametz.